On Thursday March 23, 2017 two workshops will be organised at the All Hands meeting of ELIXIR in Rome by the Interoperability and Training Platforms. Both workshops offer a half-day programme, which together form a full day with contributions related to FAIR principles and Data Stewardship. However, participants can also register separately for each half-day session. The workshop is organized in a collaboration between the ELIXIR interoperability and training platforms and the COST action CHARME (CA15110). The overarching theme is FAIR, and all its different aspects. The speakers will show tangible examples from different application domains about how they are implementing Findability, Accessibility, Interoperability and Reusability. In addition, we will address how to evaluate that (FAIR metrics). Please fill out the Evaluation form if you attended the workshop! 09:00 – 09:25 Luiz Bonino (DTL, VU University) Exposing metadata and data in a FAIR manner: an approach using FAIR Data Points. 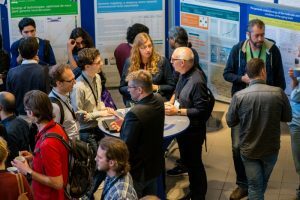 09:50 – 10:15 Rachel Thompson (Newcastle University / RD-Connect, WP5-WP8/RD-Connect Liaison) and Marco Roos (LUMC, ELIXIR-NL): Rare Disease data linkage plan for interoperability. 10:15 – 10:40 Friederike Ehrhart (Maastricht University) Using and linking molecular data for rare diseases, genetic linking. 10:40 – 11:05 Simon Jupp (Samples Phenotypes and Ontologies Team, EMBL-EBI): Semantics as a service for data interoperability. 11:30 – 11:55 Andra Waagmeester (Micelio.be) Using WikiData as an interoperable data hub for life science data. 11:55 – 12:25 Michel Dumontier (Maastricht University) Towards metrics to assess and encourage FAIRness. 12:25 – 12:40 Rob Hooft (ELIXIR-NL) data stewardship plan (also introduction /bridging to afternoon workshop). This workshop presents the technical level behind the ELIXIR data management planning portal. We will quickly explain how the portal can be used and how it is built, and spend the rest of the time of the workshop adding information to the portal together: expertise and resources coming from the different ELIXIR nodes who are participating. The workshop will also provide a space for gathering feedback and functionality requests. More programme details will follow here soon.